The Absolute Best of Downtown Toronto. This is a 692 sq. ft. luxurious executive suite with gorgeous city views in the core of downtown Toronto ! Fully equipped 2 bedroom + Sofa Bed - 2 washroom unit only steps away from all the main attractions the City has to offer. Elegantly designed space with the modern touch will leave you hesitant to leave the front door once you've arrived. This light-filled suite boasts 9 ft. ceilings, floor-to-ceiling windows, and arguably the most spectacular panoramic views that this City has to offer. 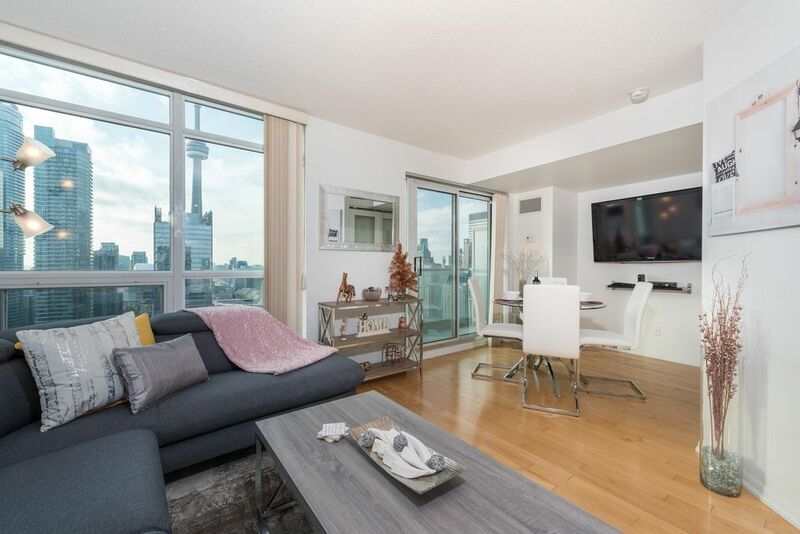 Fully equipped to meet all your needs, from all the necessary stainless steel appliances to the 58" Samsung LED TV to the complementary High-speed WiFi internet - be ready to call this place your second home. Originally a 1 bedroom + den unit was converted into a 2 bedroom - with a queen size bed in the master and a double bed in the den (no doors in the den however is closed off using curtains). For group sizes over 4, also includes a 2 person pull-out couch with attached memory foam. This suite boasts not only amazing views but spectacular location. Everything from entertainment to dining can be reached within minutes. Walk downstairs and enjoy a Toronto Raptors or Toronto Maple Leaf's game at the Air Canada Center or explore Toronto's financial district. Travel 5 minutes east and you're at Union Station/St.Lawrence Market. 5 minutes north and you're on King/Queen St., encompassing Toronto's entertainment district with famous clubs, bars, theaters, and restaurants. 5 minutes south and you're at harbour front along Lake Ontario. Connected to underground PATH that connects most if not all of the downtown core. Public transportation via TTC/Street cars also walking distance away. Uber also very popular in the city and will be very convenient as most if not all bars/clubs/restaurants/local attractions are a mere 5-10 min away. Union station and the regional GO bus system can take you to surrounding cities. The Gardiner Expressway (Highway) is also 2 minutes away upon departure from the building. Only draw back is 2nd bedroom has a curtain and not door.. so just being aware of that can help make a proper decision when sharing the space. My family had a wonderful time during our stay. You are close to everything downtown and the condo is clean with everything you need including a safe/secure parking spot. The pool area was a highlight for our kids. Moe was great and very quick to respond to any questions. We would love to return here on our next trip to Toronto. Plenty of room for 2 to 4 people. Place was clean. Lot's to do in walking distance (CN Tower, HHOF, restaurants, etc). Parking garage was convenient. Great views to the west of town. Would stay again if I ever go back to Toronto. This was a great place. Clean and bright and with all the essentials. I would love to stay here again. Getting in and out was easy. The views were beautiful. Very nice apartment, centrally located, and fantastic view. This condo was perfect for me and my two young children. We enjoyed the parking space and used our car to visit Casa Loma and get groceries at Loblaws. But one would not need a car to stay here. We walked to the harbourfront, the CN Tower, the Mirvish Theatre (Mamma Mia! ), Eton Mall, and Union Station is literally next door. There is also a little grocery store on the next block for basics. Beck cabs were plentiful. The view is really great. The couch very comfortable. All kitchen appliances are regular sized. Elevators come very quickly, the building is safe (fob entry) and the other tenets seem to be young upscale professionals. We enjoyed our stay.